Clams raised to a substantial size. Can be used in miso soup or in suimono (clear broth soup). These clams are raised at the mouth of the Amur River in Russia. Because fresh seafood spoils quickly, it can be difficult to have clams and other seafood items on hand just when you need them. With Sugarlady’s frozen seafood, however, it is easy to keep some on reserve at all times! 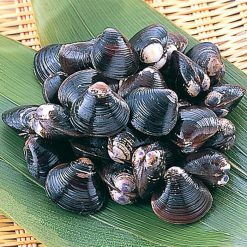 These clams can be used to make traditional Japanese dishes such as miso soup or suimono, or a variety of other dishes from around the world including clam chowder, curry, and paella. Miso soup is made using dissolved miso paste (which is made with fermented soybeans or sometimes other fermented ingredients such as rice), and can also include items such as tofu and seaweed. Clams are a good source of omega-3 fatty acids. They also contain a great deal of iron, which makes them beneficial for those with deficient iron but also means that those without deficient iron may want to consume them more sparingly. Make sure not to defrost the clams before cooking. Use them frozen. These clams have been thoroughly cleaned of sand, but on rare occasion a small amount of sand may remain; so please use caution.To prepare miso soup, fill a pot with as much water as is needed for your desired quantity of soup, and begin to heat. 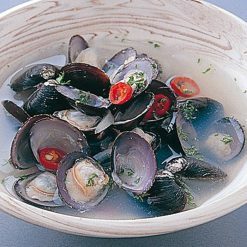 Quickly rinse the clams (still frozen) with water, then add them to the pot once it is boiling. Black powder may detach from the shells and float to the surface; scoop it out along with any foam that forms. When the clams open, change to low heat, add your favorite variety of miso, and allow the miso to dissolve. This product contains clams (Russia).. Origin of ingredients: clams (Russia). Prepared and packaged in Russia.